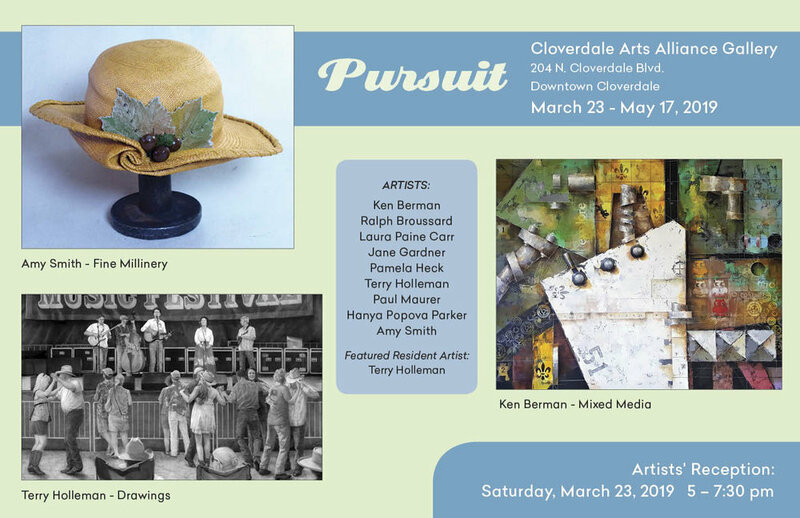 The Gallery is a gallery operated by local artists as a Cloverdale Arts Alliance program. 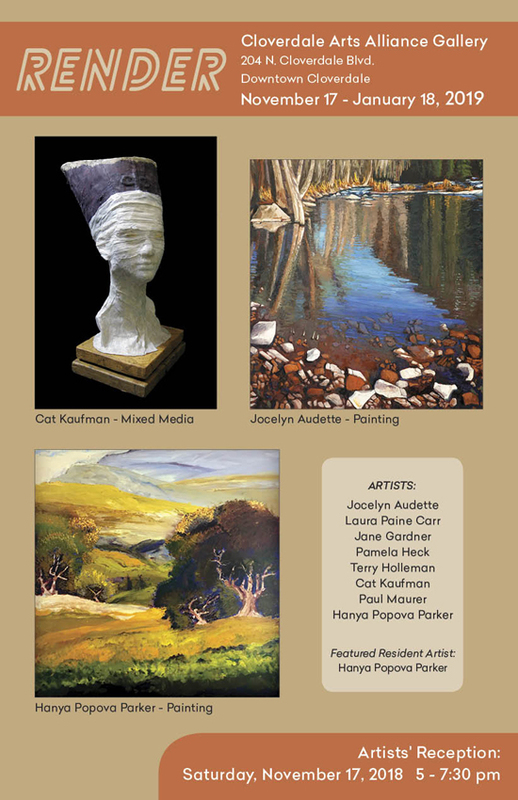 A wide variety of original artwork is offered by the resident artists and invited guests. 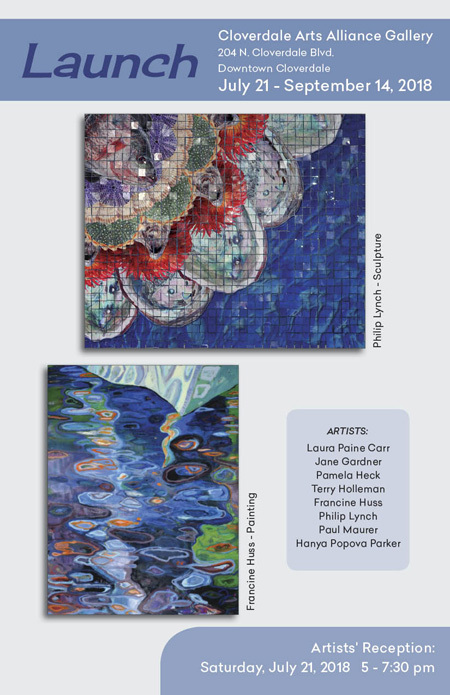 Approximately six changing exhibitions a year feature new art by the gallery artists. 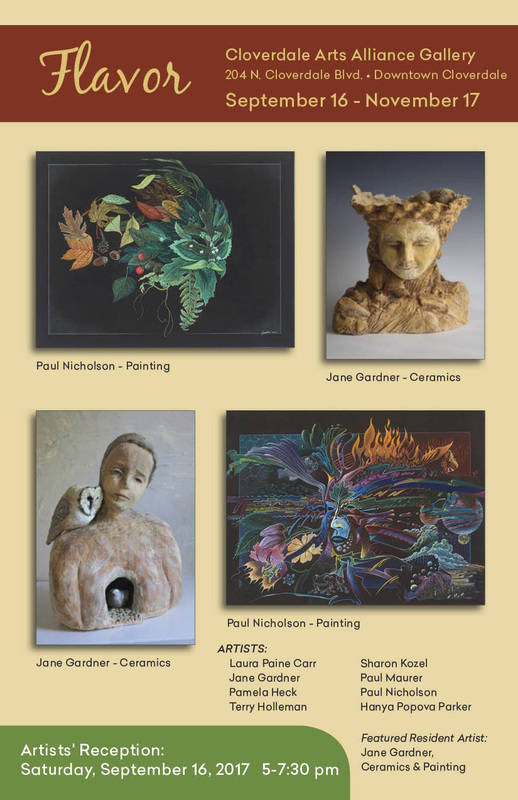 To see a virtual tour of the gallery, click here. Building forms and mechanical appurtenances have always interested me and are the primary inspiration for my work. Ever since I was an undergraduate at Lehigh University, surrounded by the Bethlehem Steel Mills, I have explored my own inner ‘factory’ with the goal of creating a visual language that articulates my own theories of art and life. roots in Cubism, Constructivism, Dadaism, Abstract Expressionism and the Steampunk movement. My current work, a combination of Rauschenberg’s Combines and Diebenkorn’s Cigar Box Lids, is meant to juxtapose the elements of childhood (stencils, etc.) with those of adulthood (machines, straight lines) to portray a modern interpretation of the caves at Lascaux and give the work an outsider quality referencing the dawn of man. Metaphorically, my work is about the mechanics of this modern age and the behavior of the people within it. the control that people thought they had in their lives and their destiny. The unknown 'purposes' of the images incorporated in my work are meant to confront that paradigm to maintain the balance between man and machine by bringing to the forefront the key concept of being human ... abstract thought and purpose. Simply stated, I make hats. It’s not what I’ve always done (it’s what I’ve done for the past 25 years or so), but a logical series of events led me here. I graduated from California State University at Northridge with a BA in fine arts specializing in textiles and weaving. I worked as a textile designer ― this led me to dyeing and painting my designs on fabric. I made clothing out of the fabric. To make the clothes look better on the runway, I made a few hats. The hats were, and continue to be, fun ― wearable sculpture. I use the best materials I can find for the job, usually straw for Spring / Summer and felt (either new or recycled vintage) for Fall / Winter. I block the material on antique blocks I’ve been collecting over the years (works of art in their own right ― not to mention a great history lesson). I usually finish by hand, adding beads and other embellishments; fine millinery with a twist. Most of my hats are designed to be worn any way you want, with attitude. My resume includes works for theater, film, television, and music productions, as well as for weddings, bar mitzvahs, birthdays, graduations, dog walking, and Burning Man. The “apparent” subject matter of all my works is various venues where " local" musicians and residents have gathered for an afternoon or evening of vernacular music and dancing. This is a type of "genre art" that has been practiced from pre-historic time and examples can be found in many periods of artistic production world-wide. It shows up as so-called " folk art" as well as in sophisticated court art by well known historic figures. The events pictured or alluded to are universal human activities. They may be ceremonial, celebratory, ritualistic or communal or some combination thereof. In a sense, I am documenting a particular vernacular subculture. What I mean by " documentation" is the degree of authenticity of a location’s detail, as well as accurate portraiture. Counterpoint to that is the fact that the event pictured, the combination of places, musicians and audience never happened. I fabricated the event from memories, impressions and photographs. My process, which is complicated and laborious is a kind of distillation which hopefully concentrates the celebratory, communal, ritualistic aspects.